I was so excited to get this book through the door last month. I finished it in one greedy glup and adored it completely. This book is fab because of Mia. Mia is so real as a character. She's full of heart but also crazy infuriating with the decisions she makes. She's that girl we all know from school. She's loud and brash and seems touchable doing what she wants, when she wants without a care in the world. From the minute you meet her you see her live up to this stereotype perfectly making those around her want to pull their hair out as they try to work out how to deal with her. However as the story progresses you start to see that underneath the surface Mia isn't at all the person she plays up to being and all her acting out is a sign of her hurting and trying to get attention because she feels lost and left out. The story itself is highly entertaining because when Mia acts out she really acts out. She really embraces the teenage rebel and takes it to the next level. 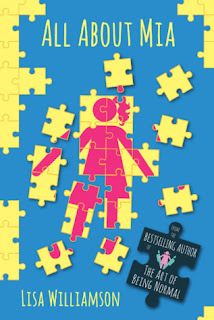 I loved following the story and getting to know the Mia under the surface and seeing how she grows over the course of the book.